In my further quest to read all the Christies, I picked up Sparkling Cyanide. As it happens this publication has a great cover so that pulled me in as well. The situation here is that Rosemary Barton is a year dead and her husband George is sure (after a series of letters) that she did not commit suicide as the inquest determined, but was murdered. He gathers together the people who were in attendance at her birthday dinner the night of her death to find the killer. It goes terribly and now it's up to Colonel Race to solve a murder (or two) and possibly a third if he's not quick about it. The characters are introduced and the story gets off the ground quickly enough but I could not help but feel that I knew this story. And not only knew it, but knew it with Hercule Poirot as the detective who needs to solve it. It was driving me to read quickly and see if I happened to be correct. Suffice it to say I found surprises here that differed from what I thought I was recalling and I enjoyed this story over all. This was my first reading of Colonel Race and I liked him but I was constantly comparing him to Hercule in what I was sure was a similar... okay, near identical, story. 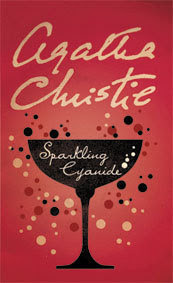 When I had finished reading, I did do a quick check and found that I was indeed recalling correctly that Hercule Poirot solves a cyanide in the champers murder as well in Yellow Iris. I'd read that short story and seen a dramatisation of it but did not know that Christie had expanded the story and brought in a different detective along with a different and very well done, suspenseful denouement. So, I do recommend this but do take note if you've already read Yellow Iris, so the similarities don't drive you batty as you read. Summary: Six people reunite to remember beautiful Rosemary Barton, who died nearly a year before. The loving sister, the long-suffering husband, the devoted secretary, the lovers, the betrayed wife - none of them can forget Rosemary. Titled in the United States 'Remembered Death'.